I came across this book by serendipity. I found it in a second hand bookshop. The owner must have found it unworthy of keeping. I was just curious of the title; plenitude could mean a lot of different things. The cost was only $20. A hard cover book could at least be used as bookend. The author Juliet Schor is an economist and an environmentalist. Her emphasis is on environmental sustainability. Being a Professor of Sociology at Boston College now, she taught economics at Harvard University a few years ago. Plenitude was first raised by Aristotle in 300BC. It asserted that everything that could happen would happen eventually. In this book, it refers to something more. Schor proposed that we should go back to basic, that we actually already have all that is needed. Sustainability is simple as we only need to explore ourselves for resources. 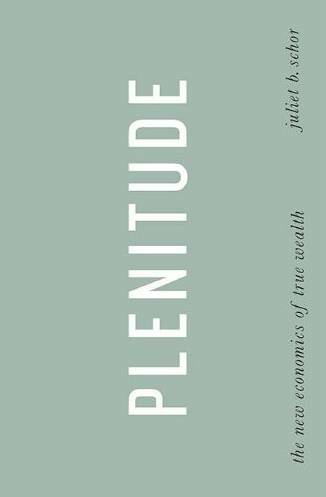 As she is an economist, she brought this concept a step further and proposed that plenitude as an economy would mean we should reshape the entire economy by freeing individuals to strive for and support themselves. The book is full of the idealistic principle of the environmentalists: everything from a thrifty lifestyle, rural living, self production of food, anti-consumerism, low carbon, recycling waste, etc. Her vision is to extend all these to the entire economy, break down large corporations, work from home. The basic tone is more leisure and less work. The line of thought of the entire concept could be summarized in three steps. The first one is the present economic problems. Three facts are exploited. Fact 1: The world economy is on a decline. This is something all economists agree. Raw materials are getting scarce and expensive, production is low, debts are high and the ecology is deteriorating. Fact 2: Unemployment is on the rise. As technology progresses, more unskilled jobs are lost. Even skilled labour is in surplus as the world is going into a recession. More people are unable to get a job, and many are unable to get a full time job. Fact 3: Growth strategy is destroying the planet. The present economic strategy to maintain prosperity is to grow continuously. We are reaching the limit of the capacity for growth, and the exploitation of natural resources for growth is detrimental to the environment. Riding on these universally accepted problems, Schor offers the plenitude solution as the second step. All methods are the liberal responses to the economic problems. First, shift out of the work-and-spend cycle. In short, salary for work is not important. No work no spending and focus on other values. Second, diversify. Earn income from different sources, including self-reliance DIY, small businesses and trading of services. Third, small scale, de-centralized, ecologically oriented businesses. The third step is a plenitude economy with alternative sources of wealth. The four pillars of such economy are: 1. Time; people could work part time, sharing a job between many employees. This could solve the unemployment problem. People then devote the spare time on recreation, leisure and other life activities. 2. High-tech self-provisioning; people could reduce reliance on the market by meeting basic needs with high-technology in growing food, producing energy, building home themselves. 3. Consuming differently; sharing expensive items and making careful purchases of long-lasting goods. 4. Connection; building local economic interdependence by trading services, sharing assets, and relying on each other in good, as well as hard times. Rightly or wrongly, the book paints a gloomy and pessimistic picture of the world. The problems at present are real and the world economy is experiencing a downturn. However, we could never be sure whether it is a cyclical phenomenon and the world economy would rebound in a few years. Natural resources are always in short supply, much depend on the ability of human to explore. The way we now use a definite amount of resources may not be sustainable. But we could not rule out that alternative materials, new ways of production of energy and new ways to use resources could sustain the world population much longer. Part time work is now more common. But it is not a lifestyle people happily choose. Many are forced into semi-employment owing to the declining economy. Should full time job openings become available, people will compete to get the job instead of voluntarily sharing a job among others so that they can work part time, receive less pay and be very happy in enjoying life. Some types of work may be suitable for low participation, or work from home. But most jobs would require dedicated effort to be done well. A general mindset change of less reliance on work, thus less commitment to work, would just reduce productivity and also quality of goods and services. With less engagement in work, people could have more free time. Whether the free time would be used in leisure activities or life activities would depend on whether the reward of part time work is sufficient for sustenance. Schor proposed a formula that with less pay and more time, free time could be gainfully employed in activities of self-reliance such as growing your own food, building your own house and providing necessary services by oneself. We did this before in the Stone Age. Whether this is still practical in the modern world is doubtful. A self-reliance community is possible in the rural area with ample land, raw materials and water. It may be difficult in a modern city. People with free time but insufficient sustenance would simply go get a second part time job. DIY household chore is a healthy hobby for many. Fashionable leisure activities include home gardening for vegetable, home made bread, solar panels, woodwork and even home decoration and construction. However, if individuals have to do all these themselves, there may not be enough free time for such complete set of DIY to support all the needs of a family. Industrial revolution introduced mass production thus saving cost, time, effort and expertise in the wide varieties of production. It would be nice if we could do some of these in free time. But to do all these by ourselves would be like going back several centuries when farming was the overwhelming human activities. Notwithstanding that, this beautiful, or horror, story could become true one day. It would not be a happy substitute of the present day economy, but could be a relegation of human civilization by several hundred years by brute force. In the unhappy event that a catastrophe destroys much of the economy, be it a major natural disaster, another world war, or unstoppable epidemic, we may need to go back to basic. This would mean abandoning large cities and returning to rural life, which would accommodate only a small world population.